If you’re searching for glass shelves in the Metro Atlanta area, look no further than Kennesaw Glass & Mirror. All of our glass shelves are customized by our talented glaziers who have an average of 20 years of industry experience, so our customers can expect a strong product that beautifully complements the décor of their home and stands the test of time. Plus, because we’re an Atlanta glass company that hand-crafts our glass products in-house, we feature much quicker turnaround times than the competition. At Kennesaw Glass & Mirror, we’re your one-stop shop for all of your glass needs. Along with offering high-quality glass products, we have a team of highly trained technicians who can perform a wide variety of services. We can be trusted with glass installation, bathroom remodeling, window repair, insulated glass replacement, and much more. 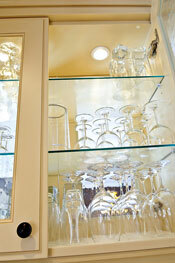 For additional information about our selection of glass shelves, please call or e-mail us today. Our glass company proudly serves customers in Atlanta, Alpharetta, Smyrna, Cartersville, Dallas, Vinings, Buckhead, and many other surrounding communities.